I couldnt leave it like it was, i had to move that rock and do the leveling. I definitly need a better panoramic app, any suggestions? Current progress is about 5m / hr, I think it will remain that for the next 100m or so. Last edited by Bex; 2018/12/04 at 08:03 PM. A bit of progress. I removed the bigger rocks so I could plan the line through the gully. stacked the bigger rocks on the lower side so they can form a barrier and prevent sand from washing away. Looking back you can see there is still a lot of work to level it. I took the Hardbody up to the gully today for the first time to judge the progress with a vehicle on the track. The track is ok to where the hardbody is standing. There is quite a bit of work still to get the turn right, but I wanted to jump ahead first to clear the bigger rocks out and see where the line will be. Only the big one remaining. I tried but could not split it so I hav to lift and wedge, lift and wedge and repeat untill i had it rolled away. I need to get the sledge hammer out here again. All the rocks cleared out and the sharp edges blunted to save the sidewalls. The path will follow the green line drawn in. Next I have to finish the turn and the drop into the gully. I leveled the turn and drop down. It looks a bit out of place, but previous experience showed that it will blend in once it get used. I took the bike through to where I need to work now. The line is going up this step, but more to the right. The line passes between two Myhr trees (Mirre boompies). The Myhr tree on the left looks like it recently got some water, I just have no idea where that would be from, we haven't had any rain this year. As far as I understand this Myhr tree is not the same as the one in the middle east, but I do not know much about it I would be grateful if someone could I'd it for me and maybe provide a link to more information. Ek is die hele week voor Kersfees uit vir vergaderings en is die eerste week van Jan uit, ek kom die 6 de terug, die res van die tyd is ek hier. Die gastehuis het nog dadels en sal he tot daai tyd. dankie...voorlopige beplanning is om daar te wees rondom 29 Des. The best closeup I have of the tree. My vriend Deon is redelik seker dis die dikvoet, Pachypodium succulentum. 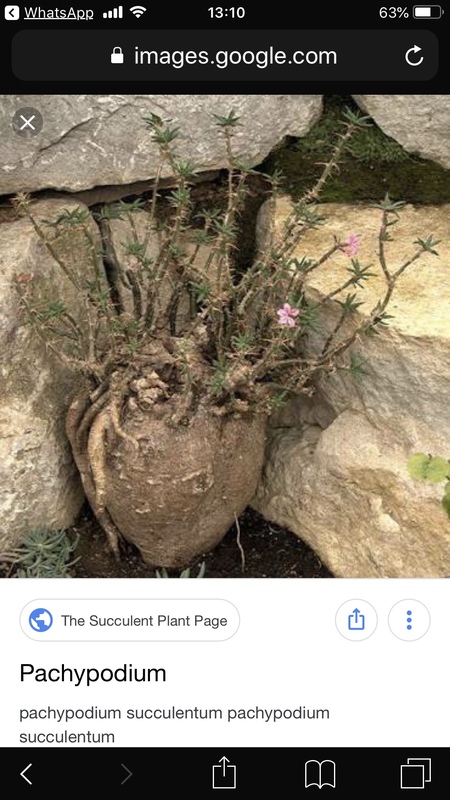 It does not look the same to me, i also looked up pachypodium Succulentum for more picture. I will make a sepperate thread and post better pictures. I cleared the passage between the trees. After. the step up was not high, about 300m , but the rock kept breaking into an overhang so I had to break it far back and then fill it in with gravel, so it ended up looking flat. So tomorrow morning early I want to clear a path through this, then a step up and another one like this. It should go quick, I would like to break through to the top by tomorrow evening. I wanted to get a lot done today so I was out there at 6 this morning. This would be the first time through the gully with the 4x4. Gaps that looked unnecessarily wide while making them suddenly did not look wide enough any more. I did manage to get through, but I decided to spend some time making the gaps more GD6 friendly. This took a bit of time, but I don't want to see any more men cower while angry wifes go on about scratches and dents. It fit through the gap between the trees without problem. Then I could start on the gap I wanted to clear. The sun was just reaching the work site and the light was not great for pictures so I didn't take many. It took about 2 hrs to clear it out. The gap was too narrow and I did not want to break away everything so I left the ledge on the left intact. You have to get both left wheels up onto it. At the top there as an axle twister and I had a bit of trouble getting through. The limited slip differential could not quite get me through so I backed off a bit and filled the hole on the right with a flat rock and some gravel. I got it Through. I had run out of time as I had to go do some work, but the hardest part in this pass is over, I will see if I can get to the top this afternoon when go make up for the time I lost widening it for some bigger vehicles. Last edited by Bex; 2018/12/09 at 02:15 PM. Bex, this country needs more people like you! Keep up the good work.....would love to come visit you some time. Thanks Snyks. I look forward to more 4x4 enthusiasts driving the trail. Pedro joined me this evening, so we made short work of the last bit of the pass. A last climb to the top. On top of the plataeu there is a lot less work to do, so I did another 500m before turning back. I do have to plan the trail and mark it out. I have however now reached the point where traveling to where I am working takes too much time to do it in short bursts. I will have to do most of the trail on the plataeu in one or 2 trips over weekends, and then start to work on the descent from the other side. The next 3 week will be hectic so I don't think I will add much to the trail till around Christmas. I will drive on it a bit though. They really enjoyed testing the first part of trail C.
Just some random pictures of recent activity on the Trail A. I think a more detailed report will be forthcoming at some stage. Last edited by Bex; 2018/12/12 at 01:46 PM. The FJ did a climb up a rock that have not been attempted before. I did talk about maybe adding it in a previous post. We had to clear away a few rocks at the top for it to get over it as i didnt finish it before. The aproach to the rock is on the rear side, and the steep part of the climb has a 90 degree sharp left turn before it gets to where it is parked in the picture. Mark rose to the challenge an the rock is therefore named "Mark's challenge"
The cross over on the edge of a big drop. Dropping into the river bed. I will probably resume normal trail building posts in 2 weeks time, for now I have too many irons in the fire. Last edited by Bex; 2018/12/12 at 11:18 PM.